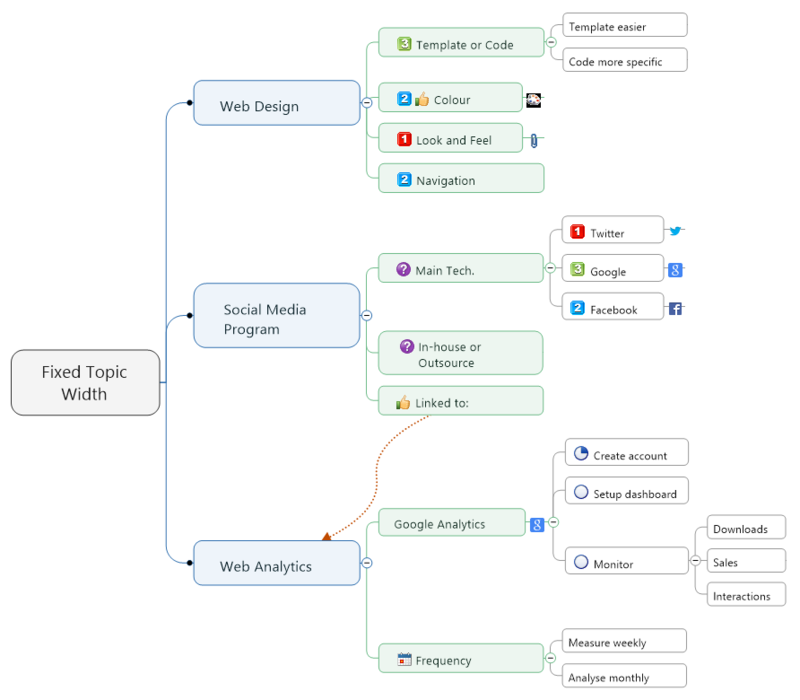 When we use Mind Mapping Software we enjoy the benefits and qualities of the visual aspect of the information we map. We are also, to some extent, pleased by the aesthetics of the Map as we view the information contained within. Now, if you are anything like me, you may also like a certain amount of order in your Maps which is kind of at odds with the “let your thoughts flow and Map” concept, but there is something about a nicely presented Map that gives us a warm and fuzzy feeling inside especially when we are going to share it to all and sundry. 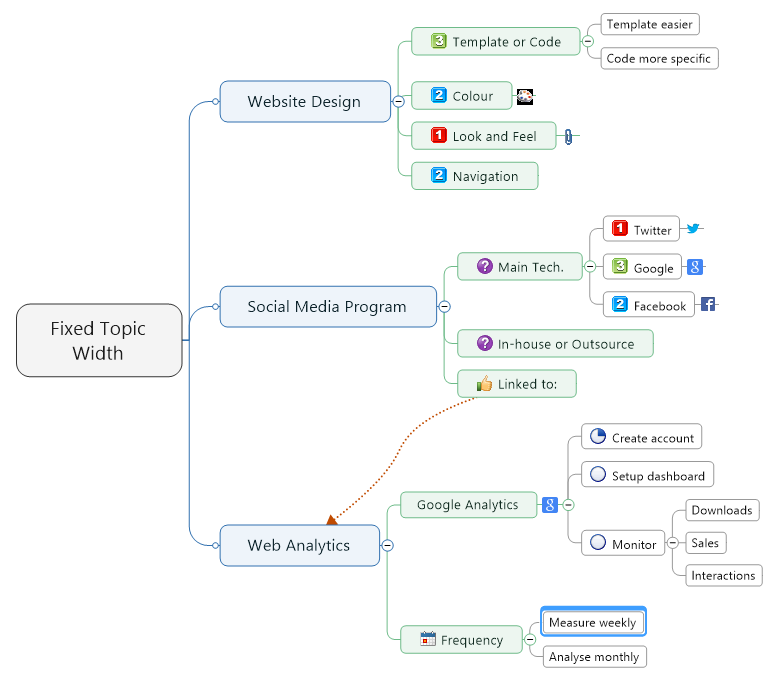 MindManager Map Topics define their width from the Text contained within the Topic. The more you type, the wider the Topic becomes. As almost all Topics have different Text this means that you have a multitude of different width Topics in the Map. This is not too bad if your Map is perhaps 1 or 2 levels in-depth but as you add more levels the difference in Topic width becomes more noticeable. The Map layout starts to become uneven where Sibling Topics begin and end at different points. This can be seen in the Map example below. So how can you overcome this and get the Topic Siblings to look more evenly aligned and the Map more balanced? Well, there are a couple of methods you can try if you’re using MindManager. In this method you manually adjust the right hand margins on each Sibling Topic so they become the same. 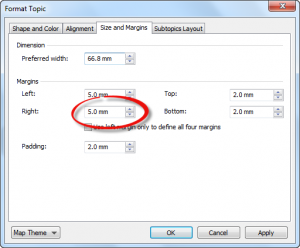 In MindManager you can right-click, select Format Topic and then Size and Margins. This will display the dialog that will let you adjust the Topic margins. Although you can get an evenly lined set of Topics doing this, each Topic requires a different setting and you simply have to manually adjust each one until they look as though they are inline. Possible to do but a little fiddly and time-consuming. In this method we try to “pad” the Topic Text with trailing spaces. This is slightly quicker but is not ideal and as with the earlier method, any change in the Topic Text will then screw up the alignment and you will need to re-adjust either the changed Topic if the new width works with the remaining Topics or each of the remaining Topics to get the alignment back. I have to thank a colleague for suggesting this one as it was something I had missed. 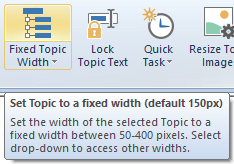 Alex Gooding, a keen MindManager Power User, suggested using an image of a known size on the Topic to force the Topic width. This was inspired from a thread on the subject in the Mindjet Get Satisfaction forum where Alex and others offer guidance and advice to MindManager users. You can view the original thread here. If you use this method you either have to make the image the same color as the Topic Fill or use a transparent image so it is not visible. This achieves the desired result but it is difficult to manage manually as you can’t see the image. Try clicking to show the “adjust handles” on a transparent image for more than a few times and you soon realize a trip to the local asylum may be required in the near future. It is not an easy or enjoyable task, especially if you have lots of Topics to work with. So what is the best way to achieve this result? Easy! 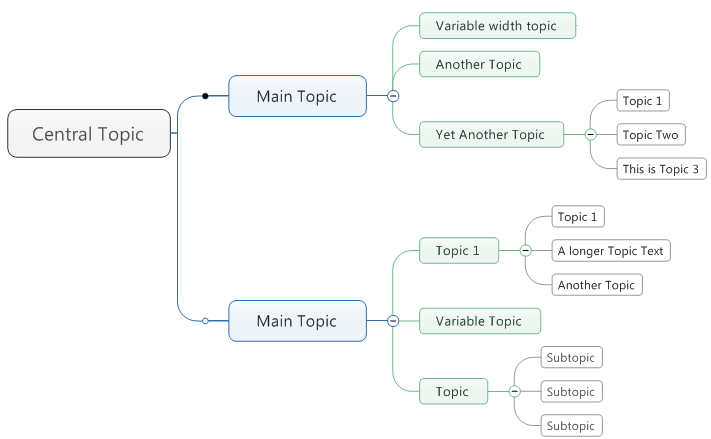 Use the Fixed Topic Width command now available in the MAP for MindManager. 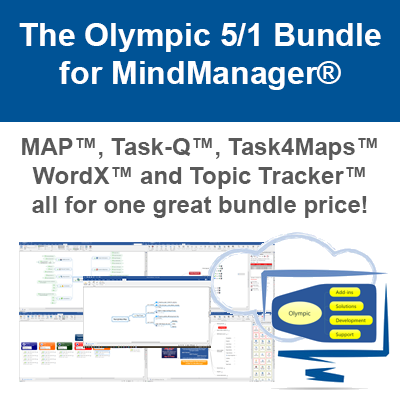 The MAP for MindManager now makes this a relatively easy and straight forward process and automates much of the work which saves you stacks of time. Fixed Topic Width is the new command added to the MAP for October. It will let you apply pre-set transparent images to Map Topics so you can achieve Topic alignment as shown in the before and after examples below. You can choose from 15 pre-set widths selected via the drop down menu on the Fixed Topic Width command. 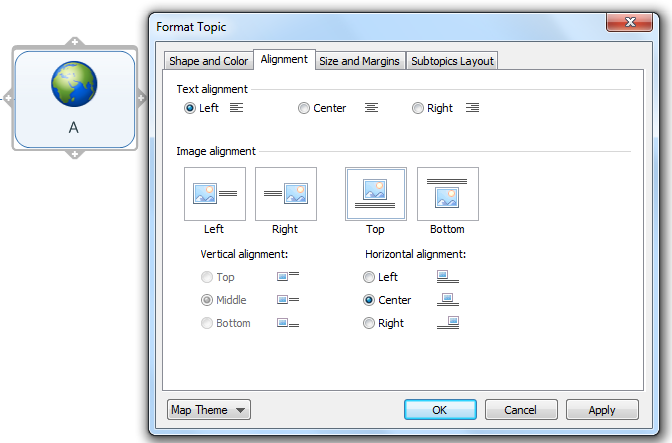 The main command, accessed by clicking the top half of the menu button, applies a default width which is chosen and set in the MAP settings enabling quick application of your most commonly used width. This command also adjusts top and bottom margins to make the Topic Text appear centered vertically in the Topic. If the width you need is not catered for by the 15 pre-set options you can use the Resize Topic Image command, also available in The MAP, to adjust the transparent image to any desired width giving even greater flexibility. Getting correct, even alignment with this alone is not possible when you work with Topics that have Icons or more than one line of Topic Text. When you work with the pre-set widths, Icons and multiple Texts are automatically adjusted to get the alignment as close as possible. Because of the way MindManager sets the Topic width, using the Text, the Icons, the Shape, the number of Text lines etc., it was quite difficult to work out how to achieve fairly consistent results. In the end we had to create some code to check each Topic Icon, its type and even take into account carriage returns in the Topic Text. Doing this gave us a way to find how much an image would need adjusting to achieve useable results. We hope we have managed to do that with the Fixed Topic Width command and in 80% of cases the pixel tolerance achieved is within +/- 1 pixel out to Topic level 5. The other 20% are usually within +/- 2 pixels. There are some issues we are still trying to resolve and hopefully we will be able to do so in future MAP updates. The first is that because of the method used to achieve the fixed width you cannot have an actual image on the Topic. Icons are fine but you can only have one image and that is the transparent one used by the command. If you use the command on a Topic that has an image the image is replaced. The second is that if you use the command on a Topic that has a Relationship, the Relationship will get removed. This means you would have to re-apply the relationship after using the command. The third relates to Topic Text alignment. Because we are using an image to force the Topic width the Topic Text will take on the same alignment as the image. This can confuse you until you get the hang of it. The screenshot shows this anomaly with the example Topic with a centered letter ‘A’ although the Topic Text alignment is set to ‘Left’. There may also be combinations of Map Topic/Icon/Shape/Text that do create a slight deviation from the above. If that does happen please let us know the details and we will see if we can fine tune the method we have used to create better accuracy. The Fixed Topic Width command will be available with the 1.1 update of MAP for MindManager which will be released on 1st October 2014. Follow us on Twitter @NigelGoult to be the first to receive notification of this latest update. 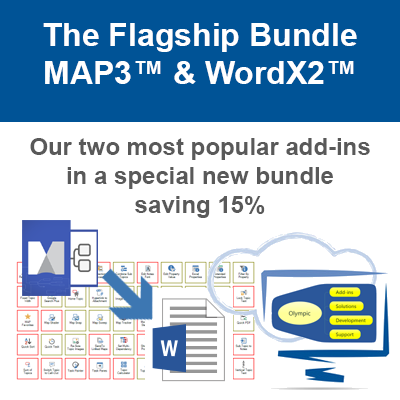 Download a 14 day trial of MAP for MindManager from the dedicated MAP for MindManager website and start mapping better and faster than ever before.